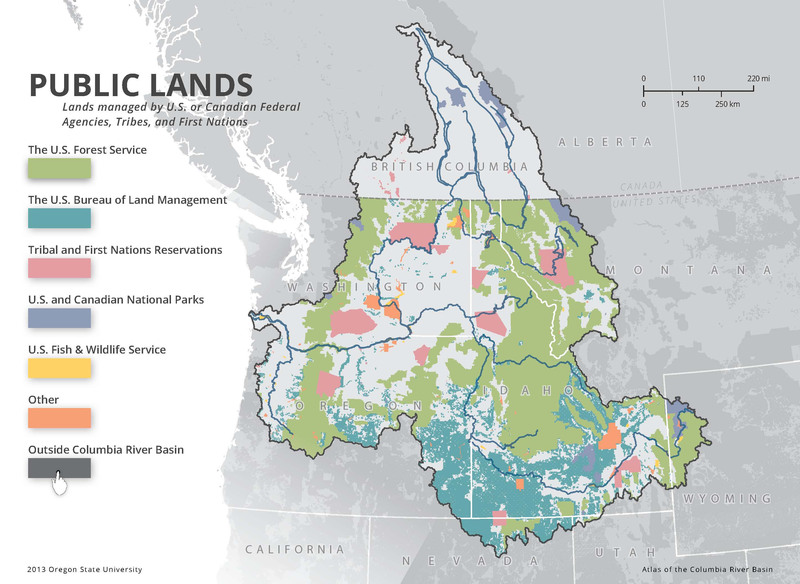 The Columbia River Basin comes to life in a new digital atlas produced by Oregon State University cartography students. They have created an iBook — accessible via Apple’s iPad — which combines the look and feel of a traditional paper book with the touch-screen features of a tablet computer. Through colorful maps, animations, photos and video, the new atlas allows users to explore the basin’s geology, climate, social history and land use. It shows the location and extent of historical and current tribal lands — Kootenai, Nez Perce, Umatilla and others — the region’s population centers and a time-lapse display of dam construction from 1900 to the present. Maps also show the location of salmon runs, public lands and sites for hiking, skiing and boating. Under the guidance of Bernhard Jenny, cartographer and assistant professor in the College of Earth, Ocean, and Atmospheric Sciences, 17 graduate and undergraduate students published the Atlas of the Columbia River Basin. It can be downloaded free as a PDF (without the interactive features) or an iBook from the cartography and visualization group at Oregon State. Jenny has submitted it to Apple’s iTunes library. Unlike most atlases that are restricted by national and state borders, “this atlas goes across the international boundary between Canada and the United States,” says Kimberly Ogren, an OSU graduate student. Ogren helped to develop the 33-page document as a member of Jenny’s course on computer-assisted cartography. She has a Master’s of Science in Water Resources Policy and management from Oregon State’s Water Resources Graduate Program and is now pursuing a Ph.D. in geography. The interactive iBook will be particularly useful for people participating in ongoing discussions about the Columbia River Treaty, Ogren adds. That agreement between the U.S. and Canada sets conditions for the operation of dams for flood control and hydropower purposes. With 10 years notice, it could be terminated by either the U.S. or Canada as early as 2024. Government agencies and Pacific Northwest universities, including Oregon State, have already hosted meetings to define issues that could be included in a renegotiated treaty. 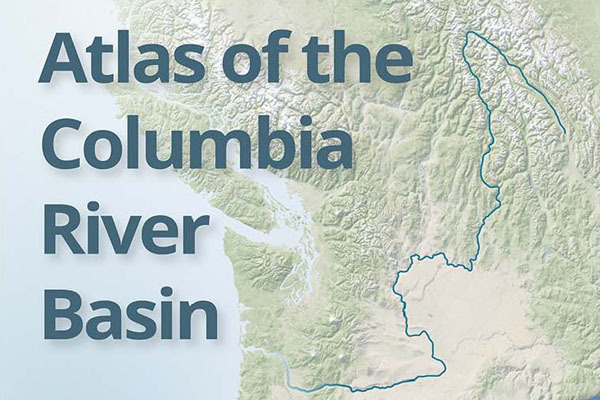 More than a useful resource about the Columbia basin, the new atlas is also a milestone in cartography. “Cartographers haven’t used these new formats with all their features,” says Jenny. He notes that the first digital map (The Electronic Atlas of Canada) was created in 1981, but it and its successors have been more useful for specialists than for the general public. “Those atlases don’t have individual page layouts or elements like diagrams and pictures,” he says. “They’re more standardized in their appearance and functionality.” Most digital atlases provide a visual interface for viewing and analyzing data rather than an educational resource for the public. 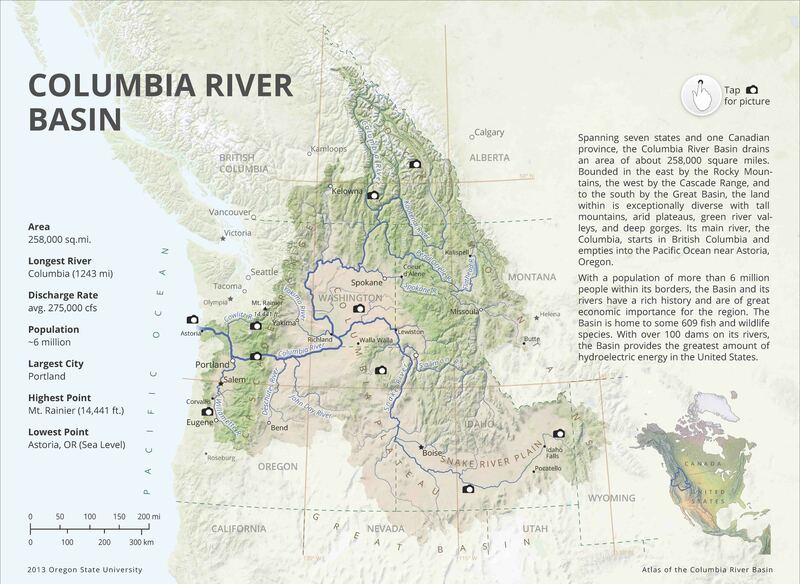 In contrast, the Atlas of the Columbia River Basin presents information in a format that is widely accessible. It includes a table of contents and chapters. It integrates digital data with other book-like features and touch-screen functions that are familiar to any smart phone or tablet computer user. The advantage for mapmakers, says Jenny, lies in the ease with which such atlases can be created. The downside is that creativity is limited to what the software allows. In addition, e-books cannot be exported to multiple brands of devices. Apple’s iBook authoring software, for example, creates e-books only for Apple devices. The evolution of atlases to tablet computers follows the growth in sales of iPads, Amazon’s Kindle and other tablets in the last few years. In 2014, says Jenny, sales of tablet computers are expected to outpace sales of desktop and notebook PCs combined. E-books have grown in popularity as well and accounted for about 20 percent of publishers’ revenues in 2012. In 2011, sales of e-books outpaced sales of hardcover adult fiction. Jenny plans to continue incorporating iBook publishing in his cartography classes. Both he and Ogren say that students in the cartography class benefited by creating a product that they could show to future employers as well as to family and friends. I loved this it really helped me out. One suggestion I would like to mention is that the camera icons are in the way and make the map look funny if you need to copy and paste and put it on a poster. But nevertheless, it is really good. thanks.